Thursday Aug 8th dawned rather wet and dull, much to the disappointment of the occupant of room No. 646 Ivanhoe Hotel, London, who was aroused from his slumbers at 5am. Naturally his temper was none too sweet at rising so early and having to face the journey that lay before him back to the land of sin and sorrow. Well at 5:15am I went down to the dining room & filled up ready for the trip. After breakfast I made for the Tube at Tottenham Court Rd. & after changing at Charing Cross reached Victoria where the usual rigmarole of stamping tickets & fussing about generally took place. Anyhow at 7:45 everything was ready & after a few sad farewells the train moved out & after a run of 2 hours (which I slept through) we arrived at Folkestone where we were put in a camp & given a fair dinner. 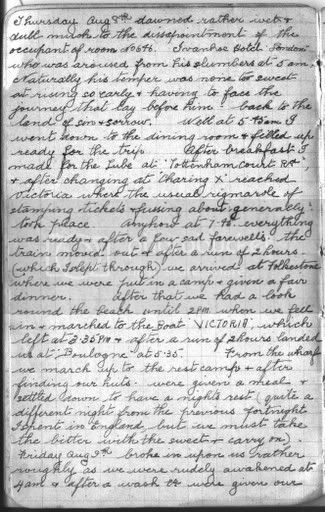 After that we had a look round the beach until 2pm when we fell in and marched to the boat "VICTORIA" which left at 3:35pm & after a run of 2 hours landed us at Boulogne at 5:35. From the wharf we march up to the rest camp & after finding our huts were given a meal & settled down to have a night's rest (quite a different night from the previous fortnight spent in England but we must take the bitter with the sweet & carry 0n). Tuesday Aug 8th. Well, I woke at about 5:30 on cool winter morning at my mother's place in Toowoomba, to the trilling of Blue Wrens in the drought-blasted remains of the garden. Later in the morning, took Mum to the GP for a heart checkup and then I completed remounting the old portrait photograph of her grandfather. Took him out of the frame yeasterday to scan him and to clean accumulated grime off the glass. Somewhere in the day, some work done (isn't the world of today grand, with instant communications via computer and internet?) Discovered that Mum's prescriptions and medications are in an awful tangle, so I have an appointment to go back and see him tomorrow t try to straighten it all out. She does forget things, and gets herself confuddled. August 1977, when I was in my 31st year. I was living in a flat in New Farm, Brisbane, just down the road from the Coffey office and Laboratory where I worked. My son had been born in June of that year. We had not long returned from the Larona Hydroelecticity Project near Malili, in South Sulawesi, Indonesia, and would soon transfer to Coffey's Sydney office. What a wonderful start you have made to this Geoff! I am eagerly waiting in anticipation, as to the impending continuing saga. It is such a great idea, to write on the actual date, to compare your life with his. And what an amazing record to have - I hope your family today will cherish and appreciate this legacy.